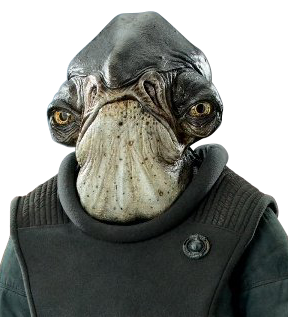 We're pretty sure Gareth Edward's choice of Admiral Raddus to lead the Rebel fleet in Rogue One had anything to do with his name or that the Mon Calamari General would be so actually rad a character. Or maybe they got the name joke. Either way, Raddus was a key minor character from the movie. It's quite possible that Raddus will overtake Admiral Ackbar in the popularity stakes over time. Hey! Calm down, nothing will ever beat Ackbar's 'it's a trap' quote from Jedi. "Rogue One, may the force be with you" is a classic line, and surely one to endure with fans. The actor who did Raddus' voice over work, Stephen Stanton, was told was to come up with a few versions of a voice that would be a cross between Winston Churchill and the General George S. Patton and that the character was a military leader. He came up with a couple of versions. He later got a call back and then found out it was for the role of the Admiral. "I say we fight!" - When the Alliance is discussing their options. "This is Admiral Raddus of the Rebel Alliance..." - Said just as he and the rest of the fleet exit hyperspace and come face to face with the Scarif defence systems. "Get me a Hammerhead Corvette, I have an idea." - During the battle Raddus commands a Hammerhead ship to ram the disabled Star Destroyer into the other ship. "Rogue one, may the Force be with you" - said as he realises all is lost for the Rebels on the Scarif's beach. We loved that in The Last Jedi, the Rebel's main ship is named Raddus in his honor.